Party Bus Group is the only company needed for all of luxury transportation needs. That’s because we offer the best prices on small, medium and large vehicles for all your Newport Beach party bus needs at the most affordable rates. Need to book for a different location? We service all of Orange County! We own and operate all of our vehicles and truly care about our customer’s experience, which is why every party bus is professionally cleaned after each event, inspected for safety and prepared for the next occasion. We offer Newport Beach party bus rentals for birthdays, weddings, concerts, proms, corporate functions and any other occasion. With the newest and largest fleet of Newport Beach party buses, Party Bus Group rentals is your one stop shop for luxury limo bus transportation in OC, California! Our main focus is always on the quality of service and we guarantee you won’t be disappointed. Just Check out our reviews on sites like Yelp, Thumbtack or top wedding sites like The Knot. No other party bus service in Newport Beach has a better reputation than us. Take a look at our reviews on profiles like Yelp, Thumbtack or top wedding sites like The Knot. You can find our company registered with the National Limousine Association (NLA) and the California Public Utilities Commission which shows we are fully licensed and insured by the State of California. We are not a broker, we operate our own fleet of Newport Beach limousines, SUVs, sprinters and party buses for any event, so rest assured you are getting the best rate for your bus rental directly with us! WHY RENT A PARTY BUS IN NEWPORT BEACH WITH US? Designated driver: You don’t have to worry about traffic, parking, or anything else in Newport Beach. Sit back and sip a cocktail or two while we handle the hard stuff. Convenience: Our party bus will pick you up anywhere or the surrounding areas and at the end of the event we’ll drop you off right at your door. It’s easy to rent with us, Newport Beach party bus reservations can simply be made by visiting our website or give us a call on 855.500.7001. Called them with very short notice, as my company decided to get us a party bus last minute for our company dinner that same night. With only a 2 hour notice, they were able to book us in their brand new party bus! Beautiful bus, equipped with changing ceiling lights, lasers, hardwood floors, a stripper pole and comfy leather seats. Will definitely be using them for future events!! We know there are multiple party bus companies out there to choose from we know it’s hard to decide. Make sure that the provider you choose isn’t taking you for a ride. Party Bus Group owns its vehicles and have tons of happy client testimonials. You have to wonder why you’d opt to go with any other party bus rental company…Party Bus Group will make sure your trip goes exactly the way it should and your friends have a great time at a great price. 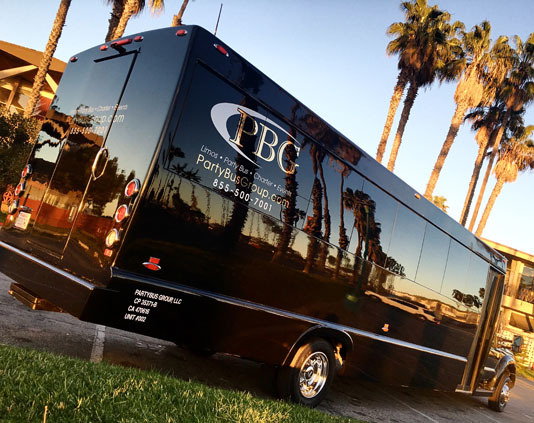 Choose the PBG as your trusted service for party bus rentals in Newport Beach CA!